Back at UFC 232 in December, Amanda Nunes shocked the world. Nunes was the reigning bantamweight champion and was moving up to featherweight to take on long-time champion Cris Cyborg. In this new division, Nunes knocked Cyborg out in just 51 seconds and became the first woman in UFC history to hold titles in two divisions simultaneously. Now, however, it’s hard to say what is next for Nunes. There is the possibility that she goes back down to bantamweight and defends her title against a contender such as Holly Holm. Or, she could rematch Cyborg. American Top Team owner Dan Lambert would like to see Nunes defend both titles, starting with her bantamweight belt. For now, Nunes is training, awaiting her next fight, but if Lambert has any say, it will be a bantamweight title defense and then a rematch with Cyborg. 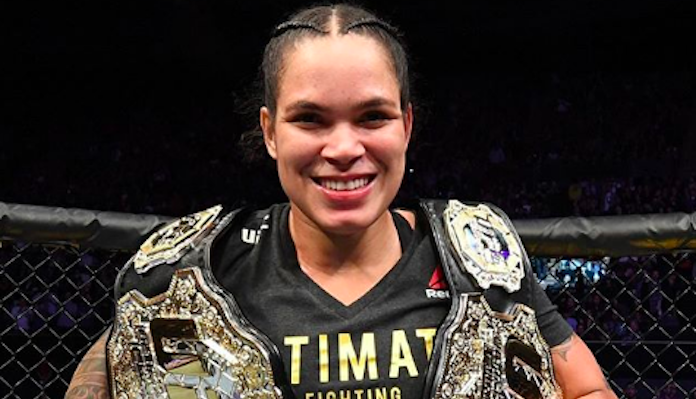 Who do you think Amanda Nunes should fight next?